Download and install a Cryptumcoin wallet for your OS from the Wallets page. Start it and let it sync. Check for an address under the Own addresses tab, you will need it in the following steps. Open the Ethereum wallet where you keep your Cryptum Tokens (CRTM) – note that you might have to load them manually in MyEtherWallet, see here. Send us ANY amount of ETH equal or over 0.000001 to address 0x9a10fF4cAAAca1033Cf72CaFce0DFFad9Eab9F3D to confirm your ownership address. Head to the Cryptumcoin claims page and fill in the form: the ETH address holding your CRTM. Fill in the address you got from the Cryptumcoin wallet. Fill in an email – we will contact you ONLY in case of a double claim for the same transaction. We will distribute Cryptucoins once every two days until the deadline (Dec 30). No CRYC will be distributed after the deadline. To create a highly popular currency. Being based on popular tech would hardly make it one of the TOP10 (although it has better chances than some of the top coins in WhatToMine), but considering how many poorly developed and meaningless cryptocurrencies make it to the TOP100 coins, we consider it paramount goal. Protecting the ICO investments – basically making it popular is enough, but we also implemented low initial start and we will invest in early exchange listing so the ICO participants would be able to trade it early, almost everywhere. Listed at the top exchanges – which requires mostly high volume. And the pre-mine will help with creating trade volume on smaller exchanges as a gateway to high volume trade on the big ones. Friendly to the miners – with an early access to exchanges, pools and tools, and power efficient and well known algorithm, and meaningful block rewards that ae meant to expand it fast, there is no doubt Cryptumcoin is going to be widesperad and friendly to miners that hate to see 0.x in their daily earnings or 0.000000x cost at the exchanges. Cryptumcoin is developed together with one of the leading mining blogs – Crypto Mining Blog, meaning it is primarily a miners’, trade-centric currency, but we developed in a way that promotes long-term investment value and that fights some common failures of other currencies launched in the past. We want to be able to use it as a main currency for our products and services in the future, and we don’t see any value in poorly copy-pasted currencies that cannot be regarded as even a short term trade opportunity, much less as a long-term investment. Power efficient algorithm – we are using one of the most power efficient and ASIC-proof algorithms today. Equihash is still by far more favorable to your bills than almost every other popular algorithm. There are some examples of even more power-efficient algorithms, like ethash, but they are either farm-friendly, non-user-friendly or simply unpopular. Less farm-friendly – with Equihash being clearly favorable to NVIDIA GPUs and NVIDIA being a bit late to the mining party, there are much less farms using “green” GPUs, and there are many more small miners using them, meaning you can expect more mileage out of your GPU. Plus the NVIDIA videocards are easier to find on the market right now. Extremely popular algorithm – this is a bit of a double-edged sword, but it allows exchanges and pools an easy integration, there are far less problems expected on software level, and there is a better chance to make the currency known to more people. Last, but not least, everyone knows how to mine it. Of course, we will still explain it in details on our website! Listed early at exchanges – we want to make Cryptumcoin popular. It will not happen only by holding Cryptumcoins in wallets, there has to be trade volume to allow it to enter the top traded currencies. With a fractional pre-mine (distributed as a small part of our Cryptum ICO) available to make it ready for exchanges since day one, and block rewards that quickly expand its presence, we hope to have it on every major exchange in less than 2 months. Developed together with Crypto Mining Blog and advertised by such a leading mining media means the coin will receive plenty of attention. Higher initial volumes also allow us to promote trade and add it to CoinMarketCap and WhatToMine faster. Announced early – with Pre-Announcement being part of the Cryptum ICO and starting well before the actual launch, we want to give equal chances to the ICO contributors to get involved and establish the trade market, and send a clear message to the miners what and when to expect. All the tools available – it’s not a rare case to see a “day 1 fair launch” that only offers a Linux wallet and a CPU miner – this is usually done to allow the devs to mine early with impunity. We will provide all the tools and their sources together with the launch. Being an Equihash-based currency also helps as the miners are already quite popular. Pools contacted ahead of the official launch date – we will contact some popular pools ahead of the launch so they can prepare for a zero day mining. Together with early listing at the exchanges, we want to create a finished ecosystem for the coin and give everyone immediate access to it. Innovative block reward scheme that addresses almost most weaknesses of coin launches launches and targets some specific problems with distribution, inflation and availability. The theoretical maximum supply of Cryptumcoins is over 98.5 million coins, which is not unusually high. Still, we had to consider that it has some influence over the market price, and that we have a pre-mine for highly-mineable cryptocurrency. We have developed changes in the block rewards according to the block height, which we call Ages. These ages address the most common issues of newly launched digital currencies and are aimed at creating a lasting currency with slowly inflating price that can be considered stable. At the same time, the ages also help us establish the Cryptumcoin as a coin dedicated to miners, and protect the initial investors that participate in the Cryptum ICO. For example, we will start with low block reward for the initial 8064 blocks. As this is the time when most ICO contributors are claiming their rewards (practically proving they own certain amount of CRTM tokens and confirming their address with a minimal ETH transfer from it), and we are listing the Cryptumcoin on as many exchanges it is possible, it is the ICO participants job to establish the trade with the early investors. Yet we will not start with completely useless rewards, and early miners will be able to take some advantage of the low difficulty. The Initial Age has a much smaller block reward that doesn’t promote early over-mining. Together with the fair launch and pre-announcement it will create equal possibilities to all miners. It also protects the ICO contributors investment early in the currency life while still allowing newcomers to mine and sell their coins to early investors. The Slow Adoption Age is the time when most people learn about new coins; the block reward becomes 50% higher (but just a bit over mean value) while the difficulty increases with new miners joining in, meaning more people will get Cryptumcoins. It also raises the max supply to 3.25-20+ times the ICO premine (depending on the ICO sales). The Rapid Expansion Age raises the block reward further with another 50%, right at the time of peak popularity growth, allowing great expansion of the coin presence and trade opportunities. This welcomes latecomers and doesn’t punish the people that started early, even after the difficulty increases by a lot. At the end of this age there will be over 15.4 million CRYC on the market. The Expansion Adjustment Age lowers the block reward slightly (11.1%) to help fight deflation and even promote slight increase of the price. We expect that this will be a time of high difficulty mining, so we kept the reward about 35% higher than the mean value. 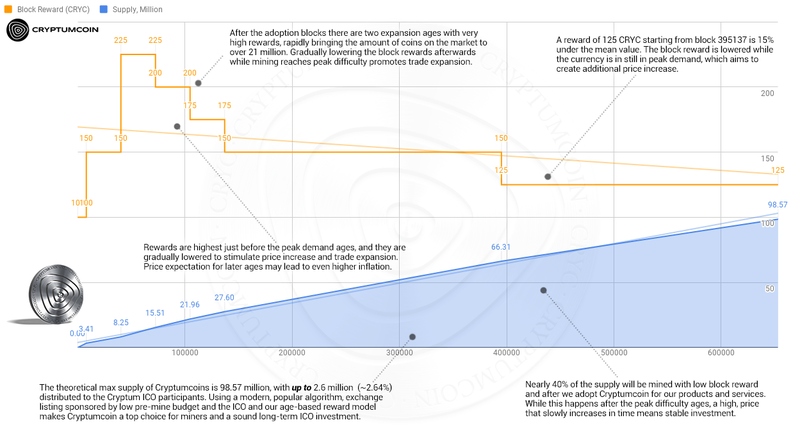 At the end of this stage the Cryptumcoin will be hard to mine, yet there will be over 21 million coins on the market, allowing great spread and trade volume. The Stable Age is basically an age of peak popularity and difficulty. At its start, the ICO premine will contribute to only between 2 to 11% of the total coins on the market (depending on the ICO sales), and this is when we plan to start using the Cryptumcoin for our services. The block reward is lowered with 12.5% over the Expansion Adjustment Age for the next 64512 blocks to stimulate trade and price growth. The Price Adjustment and the Final Price Adjustment Ages lower the block reward further to promote a stable price inflation over time without delving into the typical halving of the reward that risks alienating the miners. With over 40% of the currency life ahead of it and stable, gradually inflating price, the Cryptumcoin will have a chance to become one of the top end cryptocurrencies and keep its place for a long time. Detailed specifications, tables and additional information can be found in our Whitepaper. Additionally, you can visit cryptumcoin.com. Together with the long list of features and specific ideas we introduced in the development of Cryptumcoin, we hope to establish it as one of the most popular crypto currencies on the market. You can participate early buying Cryptum Tokens – the Cryptumcoin is only a bonus feature of the tokens as they are helping us fund board games publishing, featuring shared profits and free access to our games, but each CRTM token owner will receive initial amounts of CRYC to use as he sees fit.